In 10-inch skillet, cook bacon over medium heat 4 to 6 minutes, stirring occasionally, until crisp. Using slotted spoon, transfer bacon to bowl. Add pearl onions to drippings in skillet; cook and stir 1 to 2 minutes or until browned. Transfer to another bowl. Season chicken with salt and pepper. Place skin side down in skillet; cook over medium heat 6 to 8 minutes, turning once, until browned on both sides. Remove from skillet. Add onion and mushrooms to skillet; cook and stir 4 to 5 minutes or until lightly browned. Add garlic, tomato paste and thyme; cook and stir 1 minute. Add flour; cook and stir 1 minute. Stir in red wine and broth; heat to boiling. Add the browned chicken and bacon, spooning some of the sauce over top of chicken. Reduce heat to medium-low; cover and simmer 20 to 25 minutes, turning chicken once halfway through, until juice of chicken is clear when thickest part is cut to bone (at least 165°F). Stir browned pearl onions and butter into sauce; cook until heated through. Garnish with chopped parsley, and serve. Great served with Betty Crocker™ creamy mashed potatoes. 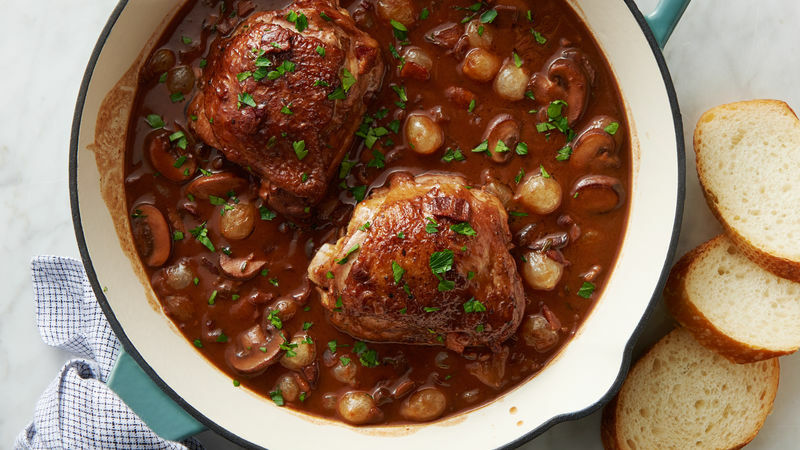 A dry red wine like Merlot or Cabernet Sauvignon works well in this recipe.